- Elder, is a demon-possessed person in a position to understand what he was guilty of, that rendered him demon-possessed? - Yes, he can. Unless his brain was affected also, in which case, it is very difficult to help him. If he is only demon-possessed, it is much easier to communicate with him and help him., but he must obey - otherwise how will he be helped? One time a person from southern Greece visited me at my Hut; he had been to India and had become demon-possessed. He spouted all kinds of swear words and foamed at the mouth. His eyes were wide open, with a wild gaze. I kept telling him "stop swearing, because that's how you invite the demons" but he wouldn't listen. And yet, he had come to me for help. He kept saying "help me - only you can help me". So I told him "How do you expect me to help? You want me to pray so that you can be released with the Grace of Jesus Christ, but you keep inviting the demons. Go and confess, ask for the Exorcisms to be read over you, then come to me to discuss the matter". But he replied "I won't go". So I said "Come inside, and let me dab some oil from the icon lamp on you". "I don't want that - I want you to help me". Then he went off and began to talk to someone else. Then after a while, while I was telling another group of visitors that God permits trials for our salvation, that person shouted from a distance, "Hey, you! Why do you say that God works so that people might be saved? We have a father in heaven, and one on earth, and further up there's a lord. "(5) "Enough with the demonology!" I said to him, and inside me I was reciting the Prayer. "Now you've confused me", he said. "Go away!" I said to him, and brushed him away from me. He curled up into a ball. "Whose side are you on?" he asked me. "Christ's", I replied. "You're lying - you're not on Christ's side, since I am Christ and you're attacking me". See how the devil had presented things in reverse? - That's what the devil says? - Yes, the devil, but you see God gave him the courage to come as far as the Holy Mountain. For him to have set off from the other end of Greece to come to the Mountain in such a state is a huge thing! Unfortunately however, he wouldn't listen and so became worse. If he had shown obedience, he would have received help. Whoever has a whole lot of pride is in the dark. His mind is in turmoil, as though it's overcome by exhaust fumes. He will make clumsy mistakes and not realize it. His perception will have reached such a degree of darkness that, no matter what you tell him to help him, he will not understand. He will say that you're pressuring him! He calls that pressuring? Try taking that thought out of his head. No, he isn't insane, since his brain is still working. He needs to understand that what he says is a denial, a blaspheming. That's how they gradually get to the point of Satan-worship. If you observe Satan-worshippers, you can tell they're possessed by the devil. You can discern a certain state of possession about them. And they lure poor unsuspecting children wherever they want, with their compelling music. They go as far as actually invoking Satan. I have heard that if you play certain "rock" records backwards,(6) you will hear subliminal messages by which they invoke the devil. They even have glorifications of Satan: "I dedicate myself to you, Satan". Terrible! - Elder, do you mean that pride can lead to demonic possession? - Yes. Let's suppose that someone makes a mistake and then strives to justify himself. If someone attempts to say a word or two to help him, he will say that they're being unfair; he will believe he is better than them and will censure them. Then he will gradually begin to judge the saints - first the recent ones, then the older ones: "He didn't perform miracles, the other one did this and that…". Then he will go even further and begin to judge the Synods: "...even the Synods, the way they reached their decisions...", so that even the Synods in his opinion don't have precision. Finally, he will even go as far as to say: "And why did God do things that way?" Well, when a person reaches that point, he hasn't become insane; he has become demon-possessed. A demon-possessed young man had come to my Hut with his father, claiming that he was a god. He had gone to a spiritual father-confessor in the world, but the priest, out of fear that the devil might pounce on him, said to the young man: "Then you bless me" (!!!) What can you say? Anyway, he kept telling his father: "You'll see, even Father Paisios will acknowledge that I'm a god". So he placed a bet with his father, with all the money that they had on them, that I would recognize him as a god. As soon as I began to "work" my prayer-rope, he sprang up from his seat. "What are you doing with that?" he shouted. "I have committed every kind of sin. I have the devil inside me and have become deified. You have to admit that I am a god! You, old man, have done nothing at all", he continued. "All you do is keep fiddling around with that (the prayer-rope)!" He went on, blurting out some very heavy accusations! I became exasperated. "Go on, get out of here, you loser!" I said to him. I gave him a thorough brush-off. He went berserk, turned into a wild animal. He took out the money that he had in his pocket, and tossed it towards his father, saying: "Here, take it! I lost the bet". - Elder, how does one understand if a person is demon possessed and not a psychopath? - That can be discerned by any ordinary doctor - a pious doctor will perceive it immediately. When those who suffer from demon possession approach anything sacred, they flinch. That makes it perfectly obvious they are demon-possessed. If you give them a little holy water or make the sign of the Cross over them with a holy relic they will react vigorously, because the demons inside them are being "cornered" (whereas if they are psychopaths, they will not react at all). Even if you are wearing a Cross and you approach them, they become disturbed and are shaken. Once, during a night-vigil on the Holy Mountain, the fathers told me that they could sense that one of the laity present was demon-possessed. I sat in the pew next to his, and touched him with my cross, which had a small sliver of the Honorable Cross inside it. He sprang up from his seat, then went and sat at the other end. When the churchgoers began to leave, I went and stood near him very discreetly. The same thing happened. I realized that he was indeed demon-possessed. When they bring little children to me at the Hut and tell me that they might be demon-possessed, I sometimes take a segment of the holy relic of Saint Arsenios and clasp it in my fist, in order to verify if it is indeed a case of demon possession. And you should see, if a child is demon-possessed, it will stare in terror at the hand that has the holy relic (secretly) clasped in it. But if the child is not possessed, and is suffering from - say - a cerebral problem, it will not react at all. In other cases, I may offer a drink of water which I have previously blessed (secretly) with a segment of a holy relic; if they are demon-possessed, they won't accept it; they will actually back away. In the case of a little boy, I had given him some sweets first - to get him thirsty - then I brought it some of the blessed water. "To Johnny", I said, "I will give the best kind of water". As soon as the boy swallowed the first sip, he began to shout: "This water is burning me up! What's in it?" "Nothing", I said to him. "What are you doing to me? It's burning me up", he screamed. "It's not burning you; it's burning someone else", I said. I then crossed the boy on his head, and his arms and legs flinched spasmodically. He went into a demonic fit. The demon had made a mess of him. Do you also remember that student who had come here in the past? "I have a demon inside me" - he had told me - "and it's tormenting me a lot. I am going through torture thanks to the demon, because it's also forcing me to utter profanities. I have reached the point of desperation. I feel it pushing against me from the inside; gripping me sometimes here and sometimes there", and the poor man would point to his abdomen, his chest, his ribs, his arms. Well, seeing how sensitive he was, and in order to not hurt his feelings and only to console him, I said: "Look, there is no demon inside you; it's only an external demonic influence that's upon you". When we went to the church, I instructed the nuns who were there to pray for the unfortunate creature of God, while I went and took a segment of Saint Arsenios' holy relic from the sanctuary. I approached him, and asked him again: "Where is the spot that the demon is pressuring you and tormenting you? Where do you think it is?" So he pointed to his ribs. "Where? Here?" I asked him again, and pressed my fist against that spot, with the holy relic clasped in that palm. He let out such a scream! "You scorched me! You scorched me! I won't go awayyyyyyyy! I won't leave!". He shouted, he swore, he cursed and uttered various profanities. Then I began to noetically say: "Lord Jesus Christ, Lord Jesus Christ, drive out the unclean spirit from Your creature", and continued to make the sign of the Cross on him with the segment of the holy relic. This continued for about twenty minutes. After that, the demon threw him down and he began to flounder; he tumbled around in every direction; his suit became thoroughly dusty. We lifted him to an upright position. He was shaking all over and making various spasmodic movements. He grabbed onto the iconostasis for support. Sweat was pouring from his hands - it was like dew on grass. The demon left him after a while, and he calmed down. He recovered, and is now just fine. - Elder, what should one pay attention to, when talking to a demon-possessed person? - He should repeat the Prayer, and treat him with kindness. - Elder, do the demon-possessed remember what they had said during their crisis? - Some things they remember and other things they don't. We don't know how God works. Sometimes He allows them to remember, so that they might be humbled and repent. Then again, when a demon-possessed person asks for something, it is not easy for one to perceive when the request is by the devil or if that person truly needs it. I had once met a demon-possessed young woman. She had read Kazantzakis' books and came to believe certain blasphemous things, and finally ended up possessed. The demon suddenly took hold of her and she began to scream, "I'm burning up! I'm burning up!" Her folks held her down for me to sign her with the Cross. Then she screamed, "Water! Water!" So I said, "Bring her some water." "No, no" her folks replied, "because someone told us not to obey what the demon says". "But the poor girl is thirsty now", I said; "bring her some water". I could tell when burning is attributed to the devil and when it is genuine thirst. The poor soul gulped down a couple of glasses of water. "Burning coals...." she said. "That's the kind of burning that I felt. Even if I were to drink a whole bucket of water, it wouldn't put out the fire inside me." That's how intense the burning sensation felt! - Elder, when a demon-possessed person begins to shout, how can we tell when it's the demon speaking through that person, and when it's actually the person himself? - When it's the demon speaking, the person's lips don't move normally; they move somehow mechanically. Whereas when a person is speaking, his lips move in a normal manner. When a demon-possessed person is shouting while exorcisms are being read or when others are praying for him, sometimes the soul itself is tormented, and it will say -for example- to the demon "go away - why are you still here?" and at other times the demon will curse the possessed person, or the priest, or it will blaspheme Christ, the Holy Mother, the Saints. It will sometimes utter lies, or, sometimes will be pressured by the truth. Then again, the demon-possessed person might utter things that come from spiritual material that he has read. These things are so complicated. That's why, when you do talk to a person like that, you should be careful, very careful. Don't pay attention to his words. He might utter -for example- "you're burning me". If one indeed feels that they're "burning" the demon and they say to themselves "I've burnt the demon", then they're doomed. If they aren't "burning" the demon but believe that they are, then they're doubly doomed. It may also cry out "you're filthy", but to a specific person it may say "you're clean". If that person believes those utterings, woe to them! That person is doomed! That's why you shouldn't experiment with the devil. A demon-possessed person was taken to a monastery, and the abbot there instructed the fathers to go to the chapel and pray for him with their prayer-ropes. In that monastery, they also had as a holy relic the head of Saint Parthenios(7), bishop of Lampsakos; this had the demon "cornered" quite a bit. At the same time, the abbot assigned the reading of exorcisms to a certain priest-monk. This monk was pious outwardly, but inside he was secretly arrogant. He was a fighter and a stickler in everything he did. He used to counsel the others, because he was also scholarly. He himself however would not receive help from anyone, because out of respect, they would hesitate to tell him whenever they saw him doing something incorrectly. He had created illusions inside himself that he was the most virtuous one in the monastery etc., so the evil one grabbed the opportunity that day to harm him. The demon implemented its wickedness and made him think that he was driving it out of the demon-possessed person. So, as soon as he began to read the exorcisms, the demon began to cry out, "You're burning me! Why are you sending me away, you cruel one?" - which made him believe that the demon was being burnt by his exorcisms - when it was the praying by the other brethren that was pressuring the demon. So, he replied to the demon, "Come to me". These words had been uttered by Saint Parthenios to a demon, but he was a saint: Once, when a demon was crying out "I'm burning, I'm burning, where should I go?" the Saint replied "Come to me". But during that incident, the demon replied to the Saint: "Your name alone burns me, Parthenios!" and immediately departed from the possessed person. Well, that monk attempted to act like Saint Parthenios, but became possessed himself. From that moment on, the demon controlled him for years on end, and he couldn't find rest anywhere. He was constantly on the move - sometimes outside, in the world, and other times on the Holy Mountain. How that poor soul was tormented! That terrible state had caused weariness to his soul, as well as physical fatigue accompanied by tremors. And you know, even though he used to be a good priest, he could no longer minister. (8) See what the devil can do? - Elder, does coffee drinking have anything to do with the reactions of a possessed person? - When the nervous system is upset and one has too much coffee, the nerves become weakened and the little imp exploits that state. It's not that coffee itself is something demonic. The little imp makes use of that reaction to the nerves and the possessed person's reaction becomes even worse. - Elder, it says somewhere that the devil lurks inside the heart of the demonically-possessed, but does not want that person to be aware of it, for fear of being cast out by the Prayer. Is that so? - Yes, because the demon is given the right to remain inside the possessed person for a time and is therefore able to lurk there, whereas with the Prayer, it is pressured, it revolts and can flee. The Prayer is "heavy artillery" to the devil. They had brought a demon-possessed young man to my Hut, who repeated the Prayer continuously. His father was a monk, but had discarded his monastic habit and got married, so the poor lad was born with a demon. That was how God's providence allowed matters - so that the young man reap a reward, his father be saved, and we monks have as a brake such examples of monks leaving their calling and thereafter being tormented. Anyway, the demon in him was suddenly roused and the young man began to cluck like a hen. "What's the matter?" I asked him (while I was noetically saying "In the name of Jesus Christ, come out you unclean spirit from this creature of God!"). "I want to depart" shouted the demon "because he is tormenting me so much by constantly repeating the Prayer. I want to get away to Pakistan, to find some peace and quiet!" - Elder, why didn't the demon leave the young man, if he was saying the Prayer? - It must have been because the young man had also given the demon certain rights, but the demon had its own boss from whom it was receiving instructions. - Elder, when one prays for a demon-possessed person, what should one say? - First of all, one should glorify God: "Thank You my God" he should say "for helping me so that I am in this state when I could have been in this person's situation, with not only five or six demons, but thousands. I beg You, please help Your servant who is in so much suffering." In other words, one should first say a prayer from the heart and then continue with the Prayer, "Lord Jesus Christ, have mercy on Your servant." Sometimes, we who pray can become the cause for the demon to not depart from the possessed person, because we pray with arrogance. For instance even if we make the slightest arrogant thought, "Ah, my prayer will help to drive out the demon", divine assistance is immediately hindered and we instead help the demon to remain in place. We should always pray for the demon-possessed with humility, with heartache and with love. There was this demon-possessed woman who really made my soul ache. The poor thing, she showed condescension to the devil by saying "yes" to it, and it has been plaguing her for years. It has been burning her flesh. She and her husband go from monastery to monastery - and they even drag their 16-year old daughter with them - and they sit all night in church during night-vigils. If she were a man, I would hug her tightly - the demon suffers terribly when you embrace the possessed person with divine love. When you don't aggravate the demon-possessed person and don't go against him/her but instead feel compassion, the demon will depart, for a short or a long while. Humility is the worst kind of "shock" for the devil. In a monastery, during the time that the pilgrims were venerating the holy relics, one of the visitors (who was possessed) suddenly burst out, saying to the abbot in an angry voice: "Are we forced to do this?" The abbot responded with kindness, saying, "No, not forced. With your own will". Then the man replied, "I will go and do it, by force!" and rushed towards the holy relics and venerated them. See? The demon was pressured by the abbot's humble attitude and kindness. That's what demons are afraid of. - Elder, are the demon-possessed helped any by the grace of the Saints, when they go on a pilgrimage on the day the Saint is commemorated? - It is best if the demon-possessed do not go to the festivals on feast-days, because they distract the others from their prayers. They become the cause for unruliness. It's better if they go on the following day. And even if their folks know that there is someone there who can help him, it's best if they don't take him to that person on that day, from within the crowd. What? Are we concerned about advertising? Likewise, it isn't proper for people to gather around when a demon-possessed person is crying out. There was this little child that was possessed, poor thing, who said to me the other day, "I became an embarrassment". The crowd had flocked around him like seagulls. They don't realize that when someone has a trait and it becomes obvious in front of people, they make that person feel embarrassed. - Elder, does Holy Communion help the demon-possessed? - For those who were born possessed - and because they were not to blame for it - frequent Holy Communion is the most drastic medicine. They are in for a huge reward if they don't moan about it until they are released through the Grace of God. They are martyrs, if they remain patient, which is why it is recommended that they receive Holy Communion frequently. However, if one becomes possessed through his own carelessness, he must first repent, then confess, and then fight to be healed and receive Holy Communion - with his spiritual father's permission of course, when the time is appropriate. If he receives Communion without repenting and without confession, he will become even more possessed. A demon-possessed man who was taken to receive Holy Communion, spat it out! Christ sacrificed Himself, He condescended to give him His Body and His Blood, and he was spitting it out! Monstrous! You see, the devil does not accept any help. - Elder, can we give their names to be read during the Proskomide? -Yes, of course. The demon-possessed are greatly helped when priests read out their names during the Proskomide with a pained heart. - Elder, when someone who was possessed and has repented, has confessed and has received Communion but is not rid of the demonic influence, what has happened? - The demon hasn't left him, because his spiritual condition is not yet stable. If God helps him immediately to be rid of the demonic influence, he will immediately get off track again. That is why God - out of His immeasurable love - allows the evil influence to depart gradually. That way, the person both "pays the price" and also stabilizes his spiritual state. The more he perseveres, the more that evil will recede. It will depend on him, just how quickly he will be rid of the evil influence. Once, a father approached me, whose child was demon possessed: "When will my child get well?" he asked me. "When you stabilize your own spiritual state, he too will be helped", I replied. The poor child - even though he was living spiritually, his father reacted inappropriately and kept telling the child that he would become insane if he didn't change his ways. The father himself began to take the boy to brothels, after which, the child drifted away and became possessed. Whenever the demon overcame him, he would attack his mother with a savage predisposition. The poor mother was forced to flee to an island to save herself. The father had repented eventually and struggled to live spiritually, but the boy would not get well. After taking his son to all the pilgrimages and having learnt all the lives of the saints by heart and stabilized his condition, only then did the boy recover. - Elder, they brought a demon-possessed woman here and they asked us to tell the priest to read exorcisms over her. What should we have done? - In a case like that, it would have been better if you had suggested that her spiritual father take care of the matter. For the devil to be inside her, it means that she must have committed a serious sin - or her parents did - thus giving rights to the devil, because sin is what brings the devil. If they don't repent and confess, the sin won't go away, and consequently neither will the devil. - Elder, are the demon-possessed helped by exorcisms? - It depends. Exorcisms help, when they are read over a little child that is possessed, which has not given any rights (to the devil) and has no idea about confession; or, when they are read over an adult who has lost his mind and is unable to confess. When a possessed person's senses are intact, he must first be helped to discover what he did to bring on the demon possession; he must repent, confess, and then - if necessary - exorcisms can be read over him - because even with only the blessing of absolution (during Confession), the demon can be driven out. Some priests put together both those who are demon-possessed and others who have a certain disability and they read exorcisms over all of them. One of them had Parkinson's and yet, they were reading exorcisms over him! Even today, they brought an elderly man whom they claimed was demonically possessed. His left arm moved to and fro, and he also suffered fits. "How long have you been like that?" I asked him. "Since I was a child", he replied. I was stumped. I then noticed that the left side of his head was slightly compressed. Most likely something happened at birth, which later gave him problems. Imagine, having personal woes and others telling him he is demon-possessed and reading exorcisms over him: "Depart, you unclean spirit..." and making him a laughing-stock to the world! Unacceptable! How many children are regarded as possessed when they aren't! They brought a youngster - twenty-five years old - whom they said was possessed. I gave him some holy water to drink and the poor lad didn't react against it in the least. "What does the lad do?" I asked the father. "When did this happen to him?" "Since he was six", he replied. "They had brought his dead grandfather to our shop and as soon as the boy saw him, he was shocked." The poor boy had suffered a nervous breakdown....I mean, this could happen to an adult - how much more so to a child? Imagine, claiming him to be demon-possessed! - Elder, can exorcisms be read silently? - It is better if they are read inside us. Basically, exorcisms should be read with pain, with humility, not with pride. When priests proudly and vocally utter the words: "Depart, you unclean spirit!" 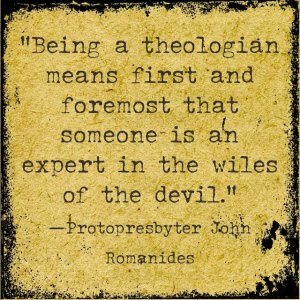 the devil becomes infuriated, angry... he then exploits the possessed person's ego and might probably say to him, "Just look at how this priest is making you look ridiculous! You should beat him up!" So the possessed person pounces on the priest. That won't dispose of the demon. It will dispose of the priest, along with his book of exorcisms. Once, there was a priest who shouted out to a possessed person "I COMMAND YOU, unclean spirit, to depart from this man!" only to hear the demon reply - through the possessed person's mouth - "Which is why I won't depart!" That's why I tell priests - when reading exorcisms - to never shout out the words "Depart, unclean spirit".... as if the demons are deaf! But, there is also no need for the relatives of the possessed person to tell others that they intend to invite a priest to read exorcisms. It would be better to tell them that the priest will be reading a Paraklesis (Supplication Service), and let him read the exorcisms silently. To tell you the truth, the demon-possessed are terribly tormented because they not only are humiliated but are also tortured by the devil! I had met a young lad of twenty-three at the Stavronikita Monastery, who was demon-possessed. He was all skin and bones. It was freezing cold outside, inside the church a wood stove was burning, and yet he was wearing a flimsy, short-sleeved shirt and was seated at the rear of the church. I couldn't bear to see him like that, so I went and gave him a woolen garment to put on. "Put this on" - I told him - "aren't you cold?" "What cold, father?" he replied. "I'm burning up". Well, that's exactly what hell is. In fact, in certain possessed people who by nature are sensitive, the little imp tells them that they won't be saved, and it leads them to suicide. How terrible! This is no mere matter! I once knew a demon-possessed man who had become a nuisance, even to the priests. He would go to them to have exorcisms read, and they would send him away. Then the devil would tell him about me also: "Don't go to him too, he won't accept you either" and this had made him fall into despair. 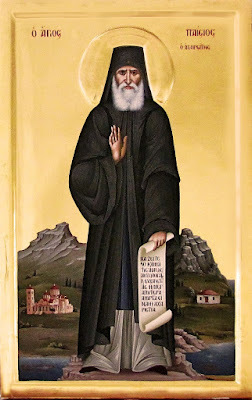 Another case was of a person who had recovered by the grace of Saint Arsenios. Look what the devil did to him! He had come here to venerate the relics of Saint Arsenios, but the Monastery was closed. So the devil appeared to him in the form of Saint Arsenios at the door downstairs and said to him: "Don't ever set foot here again - I don't want you, and neither does Paisios!" And he sent him away. See what happened? That man then began to spout abuse about the Saint, and also about me. OK, I deserve abuse, but the Saint? Anyway, the poor wretch became demon-possessed all over again. Needless to say, if one merely behaves disrespectfully, God's Grace becomes distant; imagine how much more so, when Saints are abused. He also came to my Hut and shouted: "What have I done to you, so that you don't want to see me? Why won't you help me? Do you want me to be tormented?" So I said to him: "Dear man, it was the devil that sent you away; it wasn't the Saint. The Saint doesn't send anyone away." But he wouldn't listen. He had more faith in his own conviction. Have you any idea what kind of torture these people suffer every day? But there are many demon-possessed people who suffer in order for certain others to come to their senses. Because, when they see just how much they suffer, they become concerned, they come to a realization and repent. So, don't imagine that those who become possessed are the only ones with more sins. It's just that God allows them to be possessed, in which case, they are degraded, they are humbled, they pay for their sins, they receive wages, but on the other hand, others who see them suffer are also helped. Of course one might say that there are people who commit a whole pile of sins and don't become demon-possessed; how can this be? Well, when a person has reached the point of total corruption, then he is not attacked by a demon, because God can see that he won't be helped. We need to know that even an offensive by a demonic energy is - in a sense - a gift of God to a sinning person, so that he might be humbled, repent and be saved. 1. See Luke 8:26 etc. 3. A Roman military unit comprised of three to six thousand soldiers. 4. The Elder used to say that the psychopath needs medical help by a good and faithful psychiatrist and the spiritual help of a spiritual father, whereas the demon-possessed who has his wits about him needs to discover what he has done that brought on the possession, then repent and confess in order to be rid of the demon. 5. He meant the devil. 6. The Elder was referring to the subliminal messages on records with hidden messages recorded in reverse. 7. He is commemorated on the 7th of February. 8. See the book Athonite Fathers and Athonite Matters by Elder Paisios the Athonite, pages 96-97. From the book Spiritual Counsels of Elder Paisios of Mount Athos, vol. 3, ch. 2.